The 2019 National APSE Conference will be held in St. Louis, Missouri. Pre-conference will be June 17, 2019. The conference is June 18-20, 2019. The call for proposals for the 2019 conference go out in late 2018. Please keep an eye out for future communications! Due to the National APSE Conference coming to St. Louis in June of 2019, APSE Missouri will not be holding our July Summit in 2019. 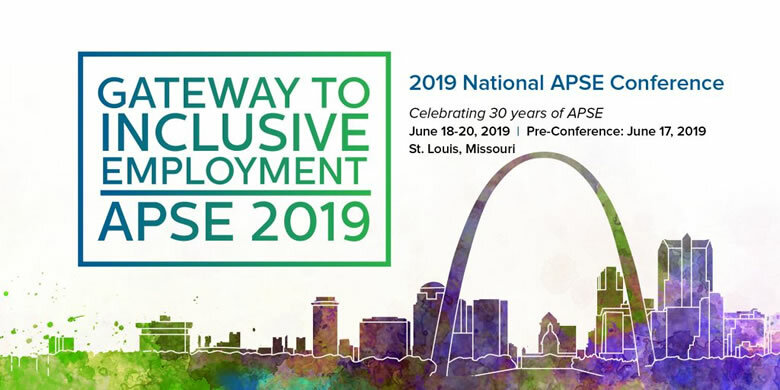 However, we know how important Employment University is to our members and have reimagine APSE-MO’s Professional Development Day (Pro-Day) and will be taking Employment University on the road to 5 different locations around the state! Ideal attendees may include individuals new to the field of traditional supported employment services or staff of sheltered work environments, and community-based adult day programs. *This training is approved by DMH and VR to meet a portion of required new staff training and may also be used as continuing education. Cost: $50 for APSE Members and $60 for Non-members. Why Attend an APSE Conference? Copyright 2018. APSE MO. All rights reserved.